The company I work for, is comprised 100% of staff members who work from home. No central HQ building, everyone is spread out across the USA. To compensate a bit for this and to build team spirit and such, the boss has us gather on an annual basis at rather nice locations to talk about the company, do some team-building and training. Since I've been with the company, I've been to Park City, UT, Chicago, IL, Atlanta, GA. We've always been put up in really nice hotels and the food is of course excellent. This year, we are meeting in Cancun, Mexico. 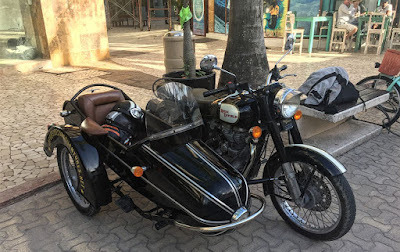 As I was being flown in already on the company dime, I took a couple of days off and flew in early so that I could take a bus down to the tourist town of Playa del Carmen just south of Cancun where Martha had told me of an outfit which rented sidecar rigs! What a wife eh? 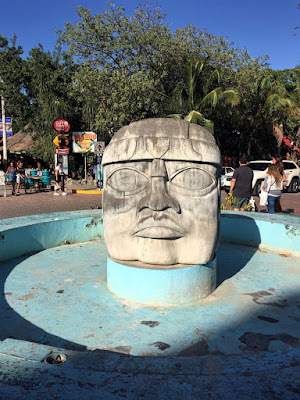 I flew down today, on a direct flight from Denver, and took the ADO bus down for less than $10; easily making my way to Playa del Carmen and finding the hostel I'd reserved near the tourist main drag. Did some walking exploration of Playa del Carmen, basically a tourist trap town by the beach. It was beastly hot and humid though which was a bit of a detractor for me. 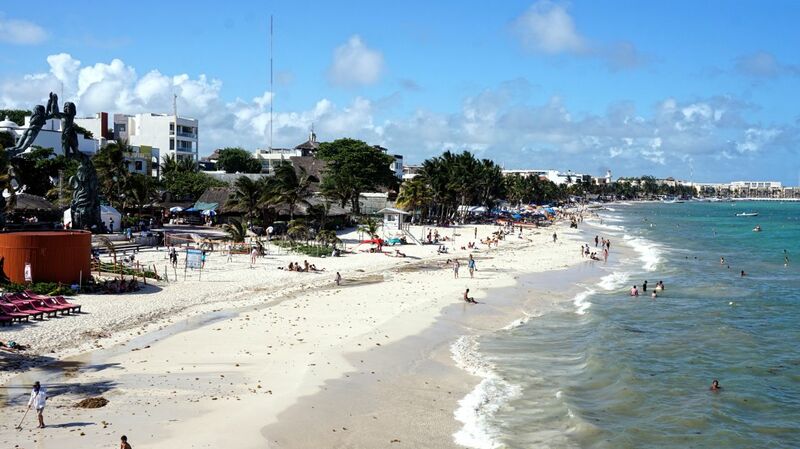 the ferry terminal for nearby Cozumel island. at the center of a traffic circle in town. After the walking recon of "Quinta Avenida", their main tourist drag, I returned ot the hostel and heard from Fredrik, the gentleman who runs sidecaradventures.net. He said he was nearby already and I could have the rig early if I wanted it. Of course, I said yes and walked over to meet with him. He was finishing some other business on the phone so I just checked out the rig in the meantime. She's a well-used 500cc Royal Enfield, and after some rather informal formalities with Fredrik, she was mine for the next 24 hours. 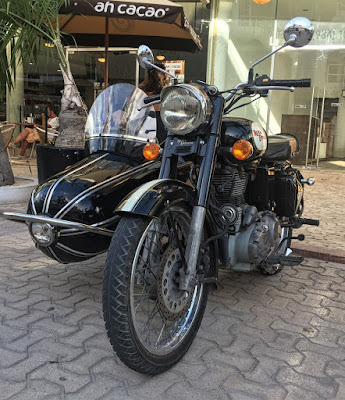 Took me a while to get used to her clutch handling, acceleration profile and rather buzzy engine but crawling through Playa del Carmen's afternoon traffic facilitated that quite well. Soon I found my way onto Mexico Hwy 307, heading south towards Calica and the commercial ferry terminal there. 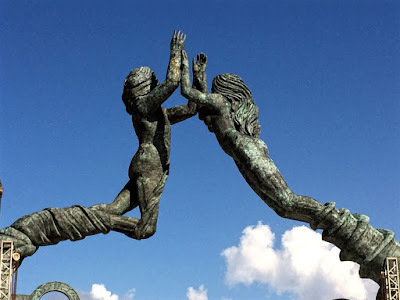 I will be trying to board the 8am ferry tomorrow to take Carmen over to Cozumel for some exploring. After failing to find a good spot to capture what looked liked an incredible gorgeous sunset (drat! ), I gased up Carmen and then after a few false turns, found my way to the secured parking lot near the hostel where I am staying the next two nights. So, I can mark Mexico down as a country I've ridden a motorcycle in, it wasn't too bad, very much like Italy in a way. More to follow. What a great opportunity, Dom. More pics, please? Do you think the RE is more reliable than the Ural? RichardM, had a brief conversation with the rental outfit's owner and he said his RE rigs have been very reliable....only things he's had to replace are cables and such, though apparently one renter buggered up the gearbox on one but he got it fixed. Had a heck of a time getting used to the friction zone on this particular rig, it was way out at the beginning of the clutch handle's swing, still, the rig did great otherwise. I've always wanted to have a job where I could work remotely. Like owning a big BMW R1200 GS Adventure, it may be something best left in the dream state rather than actually do it. For me at least. After a lifetime of work in offices and places maybe I'm not cut out for work at a distance. Perhaps retirement will illuminate things a bit. Look forward to reading more about the journey. I'm just catching up on blogs, and this sounds WONDERFUL!!! I'm looking forward to reading the next thoughts! Steve Williams, sorry for the late reply. As you saw later, the RE proved good for the task but it was close to its design limits at times. I used to believe the rig would be primary vehicle for remote work; now more as a day ride vehicle while using the RV as the mobile HQ. BeemerGirl, glad you liked this. Star Wars Day or May The Fourth be with You!